Creative life touches each moment and the more conscious one can be of that fact then the more orchestrated the creation itself can be. And in this time of Global change, when over stimulated appetites and pointless waste is in most of our lives (in the west at least), well, recycling is a good thing to do. And the ideal recycling might be to refresh something now outdated or unattractive, even unfashionable, and make it anew and loved again. Enter the cupboard ~ dark, plastic imitation wood finish, heavy in the room! So Shona & I set out to revamp it using the collaging skills learned last year at our local community centre – Canolfan Hermon – from a lovely lady called Maya Mitten. 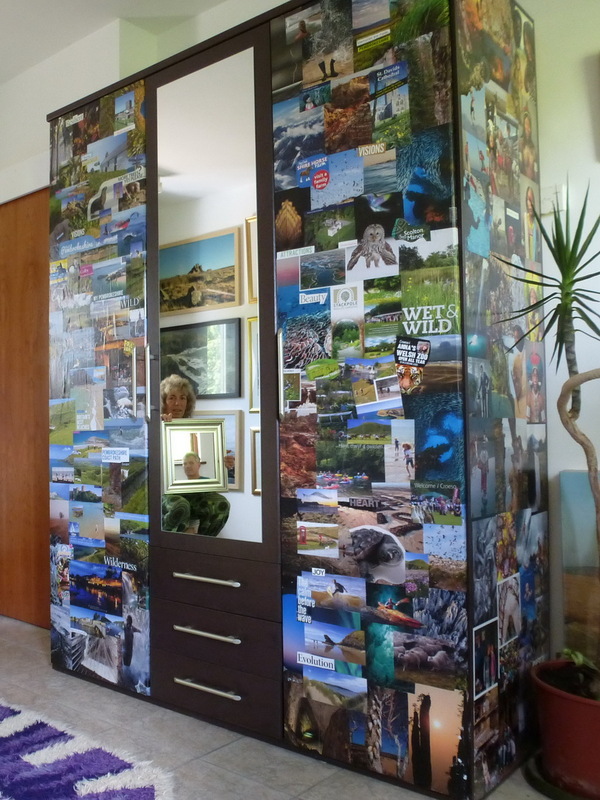 Collaged Cupboard – Michael & Shona Bossom & some old National Geographic Magazines.